So Let’s Begin. What Is A Sheep? That I must even define what I mean by the “sheep” I loathe is itself proof of what I consider to be the slow decline of human civilization. This decline has been brought about by the rising up of you sheep, and now the mediocrity which plagues our country, our science, our ethics – I dare say our entire world – falls squarely on the shoulders of you followers and half-wits given power. But let’s not put the cart before the horse, and get this creature defined. A sheep is by nature meek, with the tools to both bite and run away, but it is also an animal which, seemingly by nature, refuses to do either. It prefers, like the rest of the herd animals, to do what the others do and follow the majority, and any action performed seemingly on its own behalf you can be sure was accomplished completely by compulsion. Either by instinct (or otherwise inborn nature) or lifelong behavioristic training, the ovine nature may even be defined by its malleability, specifically by its susceptibility to this training and other forms of advertising. Psychologically, sheep have deep-rooted fears, are skittish as a rule, and are known to be literally afraid of their own shadows. They have no sense of identity other than those identifying marks and traits which, known to them or not, they borrow from other sheep: individually, the best a sheep can hope for is a long life of getting constantly fleeced by the Great Hand it refuses to run away from let alone bite, and even the daring ones, one could say the “wild ones,” of the flock – those not influenced by human direction, sustenance, or otherwise welfare – still soon find themselves part of another herd or flock, going in whatever direction that new general populace goes; and collectively, sheep have lost all sense of rebellion and the elements “pride” and “dignity,” their domestication genetically instilled, sheep having decided long ago it is better to give up freedoms and liberties in exchange for some whole grains, green grass, and a nice protective barrier for security. The Department of De Fence, the sheep call this security, which allows them surface – precisely, pastoral – freedoms. 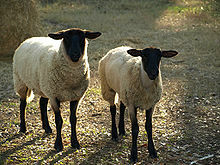 Concerning speech, for instance, sheep are allowed to bleat and many sheep emphasize this as a point of pride, the sheep failing to see that were they to say anything of any real import or significance, those possibly objectionable, even offensive things “free speech” is clearly meant to protect, life would be made much rougher for them out in the pasture. No, not solely by the shepherd, but by the other sheep, with a known history of turning on their own species in massive acts of bloodshed, too often even on their own flesh and blood. For the wise humans, the sheep are livestock to be exploited for personal gain. It is in fact the sole reason sheep are allowed, indeed encouraged to breed, so that more fleecing can be done. Now according to Wikipedia, which is as good as any I suppose when it comes to parroting “accepted” truths and otherwise encyclopedic information (the educated sheep…who can’t change a flat tire… or boil pasta): “The domestic sheep is a multi-purpose animal, and the more than 200 breeds now in existence were created to serve these diverse purposes.” Now I don’t intend to confirm this analogy to the number, but as you will soon see there are indeed many breeds, and so sorts of these simple beasts. There are the brainwashed, the parrots, the imbeciles morons and idiots, the greedy, the undignified, the prideless, the weak, the meek, the liars, the cheats, the lazies, the freeloaders, the holier-than-thous, the educated buffoons, the moneygrubbing whores, the recluses and world-haters…the list of types of sheep masquerading as humans is also very long. The day you are born you are given a number and must be registered, just like sheep and cows, you are tracked everywhere you go, and the only reason you don’t allow the powers that be to implant your child’s ear (or other body part) with their identification tag (or chip) is because you suspect that child might need that space for an earring, tattoo, or otherwise advertisement in the future. Now let’s do some numbers. There are roughly, in the United States alone, 300,000,000 individuals. According to a few sources like, the US Census Bureau, almost half of the people in America are either over 65 years of age, or under 18 years of age, making these demographic groups only prospective part-time employees at best. This means only about 170 million American sheep are actually working right now at all. Subtract the amount of these who are disabled, estimated at around 10 million, and we can see how those analysts who say things like “only 47% of Americans have full-time jobs” might not only be correct, but also doing some very gratuitous rounding-off. Now then, Of these 160 million or so possible American full-time workers, the government, by which I mean only state and federal, not local or county government, employs about 15 million (see this government-supplied tally from 2011). Add another 20-30 million on other local government payrolls and we’re down (gratuitously) to 130 million actual working adults in America that are not taxpayer-supported. It is worse from this perspective in the EU. In essence, and on a world scale, one-third of the population works to feed the other two-thirds. But from my standpoint, it gets worse. For me, work must mean production, and in the end, most of those employed produce little to nothing of tangible value. You sheep won’t like to hear it, but it makes me cringe when I hear you talk about “how rough work was” as you undo your necktie. It is telling that the sheep today have to run, exercise, and watch their intake in order to stay fit and so keep themselves pretty for more fleecing. Our farmers, laborers, bricklayer, roofers, heavy equipment operators, artisans, bakers, sewers, and other workers of production, meanwhile, are the lowest on the financial chain, while the pencil-necked stuttering species of sheep who produce nothing but changes in their wallets (like real estate, stock broking, banking, “data entry”, “brainstormers,”, speculators, 10% takers like agents, etc.) reap big financial gain. The sitting American President (I think it an especially applicable appellation), on national TV before the last election, actually endorsed the need for more white-collar jobs, this while most human sheep no longer know how to arrange for their own proper nourishment, as if South America and China will continue to provide. Oh but these sheep know not even their own shepherds. Finally, sheep amuse themselves by imposing superficial segregations such as those of race, religion, wardrobe, and other appearance, and pick opposing sides like the red and blue teams for sports and politics, in further effort to maintain any semblance of individuality. But few sheep, whether red or blue team, or white or black color, ever consider that just maybe they are two sides of the same herd. Individual and important – “real” – diversity examples, such as the myriad of human personalities (e.g. aggressive, toxic, belligerent, “bad temper, moody, loud) quirky attitudes, various demeanors and “body language,” in sum all authenticity and so real unconventionality meanwhile, become as discriminated against today by the flock as they have been ever in history. One could even argue that amidst all the talk about diversity and tolerance today exists the lowest respect for it ever. Everyone is for diversity until one truly authentic demonstration of it appears, at which time all bets are off and the ostracizing may begin. Sheep covet and understand only their own, and cannot imagine what it’s like in the next lea. To give an example, personally I am no socialist but demand regulation, and I will convince you of it here in the near future, for certain things humans have no choice about. Where to buy electricity, type of fuel, primary phone carrier, basic health care, the racketeering known as insurance…all these things, and more, need to be regulated because we do not have any options as to who buy from. Now who would oppose such a view? No, not solely the government, made up of the elected sheep, but the lay sheep themselves, the standard run of the mill variety. Because of this one opinion I will be called a socialist or communist by those sheep who like to then put me in a convenient box (save your time) and consider this understanding. An authentic human is not a sheep, and thinks for him or herself about issues, things of life, and events of living. Each issue considered by thought is an entity in itself, and one can, despite what the sheep would want to tell you in this instance, favor such regulations and still be for free enterprise, and the logic behind the whole operation entirely sound. One can also be in favor of taxing the rich a good chunk (with good justification) without being considered a welfare monger. One can be for the right to choose, and still be against abortion. So in the end, what is a sheep? A herd animal which operates unconsciously, a creature of habit and instinct alone, that long ago decided to give up its autonomy for convention. Categories: ethics, personality, political correctness, politics, sheep and sheepishness, work and labor | Tags: bleaters, clowns, cowards, domesticated, ewes, followers, idiots, imbeciles, lamb-like, lazy, liars, masses, mob, prideless, retards, sheep, sheepdom, sheepishness, undignified | Permalink.